I get asked all the time: do we really have a different smoothie every day? It may seem challenging at first, but once you get in the swing of keeping a variety of frozen fruits, a few fresh ones and a bunch of dry goods on hand, it’s honestly easy to mix, match and play. Not only does it get selective (aka “picky”) eaters out of their rut, but it’s also the best way to get a variety of foods in your body day in and day out. 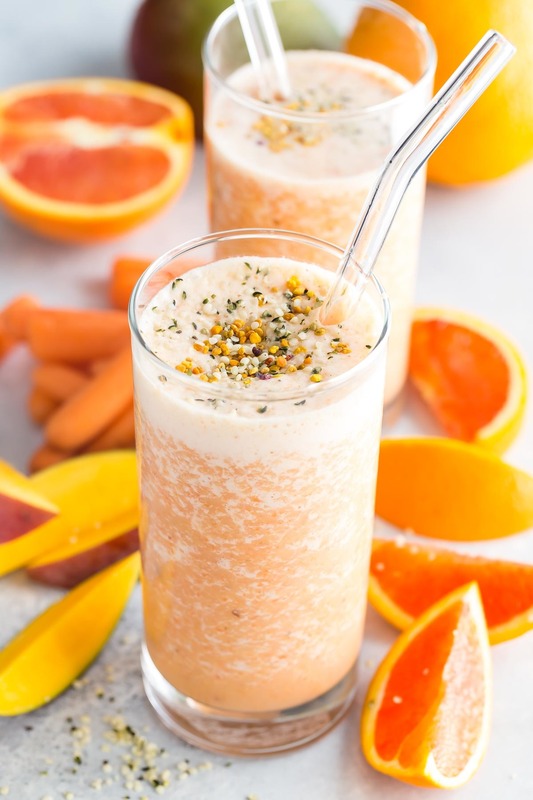 This Carrot Orange Ginger Smoothie is so incredibly healing you’ll crave it. The first time I made us Carrot Orange Ginger Smoothies for breakfast was during a week a few kids in Kenya’s class were out sick and I was praying my kids wouldn’t get it too, so I loaded them up with tons of vitamin C (from the orange), beta carotene (from the carrot), turmeric (which helps with installation), bee pollen (an amazing immunity booster), medicinal fresh ginger and a ton of other healing foods. You would think that a raw carrot and whole orange would be challenging to grind up, but in a strong blender it’s no problem at all. Just pop everything in and whiz it up. If you really want to absorb all of the medicinal benefits of the fresh turmeric you can add in some coconut oil and a pinch of black pepper which activate it’s medicinal properties. Either way you’ve got a delectable smoothie to get your day kicked off right! Wow! That looks too pretty to drink! Looking forward to trying this. Hello Catherine. Seems delicious. Now don't make fun of me but the way you say a whole orange can be hard for the blender you don't mean that we shouldn't peel it (same with the carrots I guess), do you ? What is it garnished with? Looks yummy! Can I used dried ginger and tumeric? How much of those? Made this today and loved it! It makes a lot so I am wondering how many servings this is intended for. I’d love to make this but the ingredients seem hard to find. Where would one find kefir, fresh turmeric and bee pollen in the store? I haven’t seen any of those.